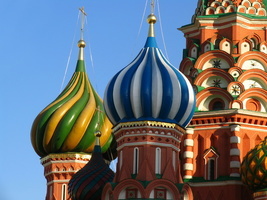 HOME » RIVER CRUISES » MOSCOW TO ST. PETERSBURG RIVER CRUISES » Moscow - St. Petersburg M/S "Nikolay Chernyshevsky"
Volga River Cruise on M/S "Nikolay Chernyshevsky"
Individual arrivals and transfers to the ship that will take you on an exciting Volga River cruise. City tour by bus will take you to the most famous areas in Moscow within the boundaries of the Garden Ring and the Boulevard Ring. You will drive by Kremlin, Red Square and Kitay Gorod area, Tverskaya, Arbat and Zamoskvorechje areas. The overview will include famous landmarks like Red Square and Kremlin, Novodevichy Convent, Luzhniki, the White House, area along Moskva River and other notable places of interest. Uglich is one of the oldest Russian towns, one of the Golden Ring cities dating back to the 10th century. 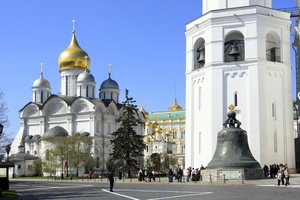 During the city tour you’ll visit the magnificent five domed Transfiguration Cathedral and Church of Czarevich Dmitry on the Blood – build to commemorate the most famous event in the town's history – a mysterious death of the 7-year old Czarevich Dmitry, the last scion of Dimitriy Rurik dynasty. Return to the ship, departure, dinner on board entertainment. Arrive this morning in Yaroslavl, another Golden Ring city. The city was founded in the 11th century by Prince Yaroslav the Wise. Sightseeing city tour will include Ilya the Prophet church, interactive tour of the former Governor's House (Art Gallery), visit to Church of St. Nicholas the Wonderworker and shopping at the local market. Goritsy is a small village on the banks of the Sheksna River where it falls into the White Lake. It is the home to the Resurrection Convent, standing at the shoreline. From Goritsy a bus will drive you to the town of Kirillov, 8 kilometers away, to tour one of the major Orthodox centers of Old Russia, the Monastery of St. Cyril on the White Lake. Founded in the 14th century, the monastery preserved its original architecture. You will be fascinated by its majestic churches within the fortress walls. 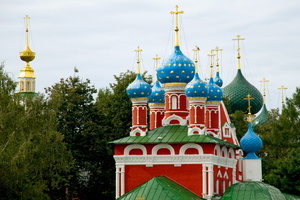 Part of the monastery functions as a museum where you will find some of the oldest icons in Russia. The small island of Kizhi is located at the northern end of the Onega Lake, the second largest lake in Europe. It is 7 km long and 1,5 wide. It is most famous for the Open Air Museum of Wooden Architecture (a UNESCO World Heritage site), especially Kizhi Pogost which consists of Church of Transfiguration, the Church of the Intercession and the tower that stands between them. The highlight is the Church of Transfiguration built by carpenter Nestor in 1714 without a single nail. The Church of Lazar of Murom is located nearby. 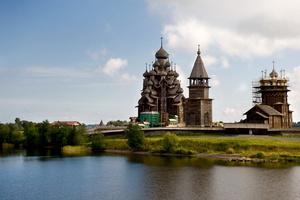 It is the oldest monument of wooden architecture in Russia – the Church was built in the middle of the 14th century and brought to Kizhi from the Murom Monastery, situated at the southern shore of Onega Lake.Other exibits are several peasant houses, wooden wind mill, large and small granaries, and farm buildings representing Russian wooden architecture. You will spend the entire day exploring the wonderful monuments and the island. A relaxing day spent cruising Russia's waterways with a stop in the village of Mandrogui - a very popular tourist spot. Explore this small Russian community with its pretty wood carving souvenirs, Museum of Samovars and Museum of Vodka (not included). The museum exhibition is dedicated to the history of the drink and its production. There is a tasting bar where the visitors can sample Russian vodka. Today enjoy Russian picnic in a picturesque setting of Mandrogui. Continue along the Svir River, then cross the largest in Europe Lake Ladoga and prepare yourself for one of the most amazing European sights - the city of St. Petersburg. 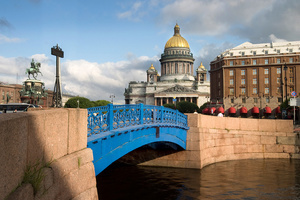 St. Petersburg is one of the most fascinating cities in Europe. The city bus tour will introduce you to the best it has to offer: elegant buildings on the Nevsky Prospect, Palace Embankment along the Neva River, Palace Square with Winter Palace and Alexander Column, Bronze Horseman - the famous monument to Peter the Great, Schmidt Bridge, Strelka with Stock Exchange and Rostral Columns, St. Isaac's Cathedral, Peter and Paul Fortress, Alexander Nevsky Lavra, Canal Griboyedova, Fontanka, Kazan Cathedral, Church on Spilled Blood and other finest architectural, historical and cultural landmarks. On your tour you will visit Peter and Paul Fortress. It was built in 1704 to defend the city from naval attacks, however it never served its purpose. Instead its history is rather gruesome: thousands of laborers died while buiding the fortress, many political prisoners, incluidng Peter's own son Alexi were kept and tortured in its cells, the tombs of the Romanov family are in its Cathedral. Optional tours and performances in the afternoona and evening. Today you will visit the Hermitage Art Museum - one of the nation's main glories.The State Hermitage occupies six magnificent buildings situated along the embankment of the Neva River, right in the heart of St Petersburg. The leading role in this unique architectural ensemble is played by the Winter Palace, the residence of the Russian tsars that was built according to the design of Francesco Bartolomeo Rastrelli in 1754-62. This ensemble, formed in the 18th and 19th centuries, is extended by the eastern wing of the General Staff building, the Menshikov Palace and the recently constructed Repository. Put together throughout two and a half centuries, the Hermitage collections of works of art (over 3,000,000 items) present the development of the world culture and art from the Stone Age to the 20th century. Tonight the ship will leave St. Petersburg and embark on an exciting journey through the Golden Ring to Moscow. 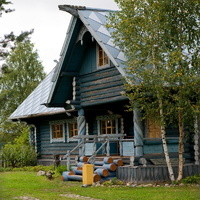 After breakfast visit Petergoff, located on the southern shores of the Finnish Gulf 14 miles away from St. Petersburg. The Grand Palace with its lavish interiors, gilded decorations, mirrors and paintings dominates the estate. The Park outside the Grand Palace is a kingdom of 144 unique fountains, all operating without the use of pumps by a combination of naturally generated water pressure and magic. Walking in the parking you will be amazed by the splendid beauty created by a man. The estate includes several other mini-museums of interest. The outwardly-modest Monplaisir Palace , which Peter I preferred to the Grand Palace , has a nice sea view and several interesting rooms, such as the State Hall where Peter would force his guests to drink huge quantities of wine until they passed out. The nearby Hermitage Pavilion, which also has nice views and artwork, is a two-storey dining room where guests sitting on the upper floor ate and drank in peace, occasionally lowering the table to the ground floor where servants refilled wine glasses and replaced dirty plates. ∙ Handling the luggage in river ports and on board. ∙ Guaranteed accommodation according to your reservation. ∙ English\French\German\Spanish\Italian speaking board guides. ∙ Onboard entertainment including Russian language course and Russian songs lessons, live music concerts, dancing music in bars at nights, Captain’s bridge tour, etc. ∙ Excursion program detailed in the cruise itinerary (optional tours are available onboard). ∙ Use of cabin safe. 1) Breakfast onboard is buffet style. Water in pitchers is provided for breakfast, while tea / coffee is served to the table. Buffet line has cocoa, milk and juice in assortment, as well as numerous hot and cold dishes to guest’s choice. 2) Lunch onboard is buffet style. Water in pitchers is provided for lunch, while tea / coffee is served to the table. ∙ Dessert (a choice of 2 variants or fruit). Water in pitchers is provided for dinner, while tea / coffee is served to the table. 1 glass of red/white wine or juice is included for each dinner. NB: During stay in Moscow and St. Petersburg the menu is fixed (no choice of dishes). During the navigation days of the cruise a choice of main course/dessert is provided – guests choose dishes for the next day each previous day. ∙ 1 bottle of still water (0.33 L per person per day) is provided in cabins. cocoa, packed tea, sugar, sweetener and cookies. ∙ Welcome Bread and Salt Ceremony on the embarkation day. ∙ Welcome cocktail including 1 glass of champagne or juice per pax. ∙ Russian Tea Ceremony with tea and Russian pies and Vodka Show with vodka and blini tasting. ∙ Cocktail party – once per tour – 1 cocktail to choose out of 3 variants per 1 pax. ∙ Captain’s dinner with upscale menu. ∙ BBQ outdoors in Mandrogui (instead of lunch onboard, subject to the weather conditions). ∙ Mulled wine (during cold weather) / ice tea (during hot weather) upon returning to ship after shore excursions. ∙ Coffee station for early risers. ∙ Optional excursions (available onboard). ∙ Cabin numbers are provided 7 days before the cruise or at 50 € supplement per person when booking. Any other drinks and meals can be purchased additionally and paid at the restaurant or at the bar onboard.